After the discovery of unsafe levels of arsenic in Nepal’s groundwater more than a decade ago, government officials and aid groups are finally taking a critical look at whether their efforts have made a difference. “We didn’t raise money for broken filters,” said US-based geologist Linda Smith, expressing frustration during a recent visit to Nawalparasi District in the southern Terai region, one of Nepal's hardest-hit areas by arsenic-contaminated groundwater, when she came across abandoned water filters. At one home, two broken cement water filters were being used as planters, while another filter distributed by the NGO she heads, Filters for Families (FFF), sat dismantled in the yard. At a neighbouring home, parts were missing from a two-bucket filtration system from Bangladesh known as a Sono. The filter stand had been converted to a clothes-drying rack. Smith retrieved unused filters and reimbursed families for the US$5 they had paid per filter, which has an actual cost of $70. “There are people who need filters, and they need to realize this,” she said. Some 2.7 million people in Nepal - nearly 10 percent of the population - are drinking water with arsenic concentrations above the World Health Organization (WHO) recommended 10 parts per billion (ppb), according to 2011 government estimates. In Nawalparasi District alone, a 2008 government survey of tube wells (shallow wells 14-24m deep controlled by hand pumps) found almost 4,000 wells had arsenic that exceeded national standards (50ppb). Another 4,418 met national standards, but not the international 10ppb threshold - altogether affecting nearly 140,000 people who depend on those tube wells for drinking water. More than half of the country’s 33,000 tube wells that contain unsafe levels of arsenic have been addressed with the distribution of filters, but it does not mean the filters are used or maintained properly, said Madhav Pahari, water and sanitation specialist for the UN Children’s Fund (UNICEF) in Kathmandu, which supports the government with arsenic containment. A 2007 UNICEF-funded study of 1,000 tube wells in Nawalparasi found that while the filters technically worked, people were not maintaining them properly, which then rendered them faulty and then, ultimately, useless. Little has been done to address the problem, in part because arsenic is not seen as a high priority for the government, said Pahari. 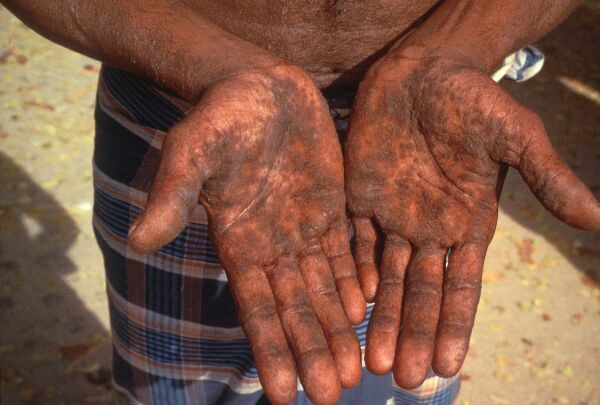 Hands of an arsenicosis patient in southern Bangladesh. Prolonged exposure to unsafe levels of the metal arsenic in drinking water can lead to poisoning, or arsenicosis. Symptoms include skin problems, cancers of the skin, bladder, kidneys and lungs; diseases of the blood vessels of the legs and feet; and possibly, diabetes, high blood pressure and reproductive disorders - but the cancer can lay dormant without spreading for years, even decades, notes WHO. According to a senior engineer in the government’s Department of Water Supply and Sewerage (DWSS), Dan Ratna Shakya, arsenic is indeed a priority, but the government has lacked funding and the right technology to figure out what works best. Pahari as well as Shakya said UNICEF and the government have both lagged in evaluating the filters, used for the past six years. DWSS has never conducted a comprehensive water quality testing programme before, said Shakya. Pahari said there is a plan to compare the efficacy of Sono filters produced in Bangladesh with locally produced Kanchan arsenic filters. Today, the Sono filter remains one of six technologies certified for sale in Bangladesh - one of the most affected countries worldwide in terms of arsenic-tainted drinking water, according to WHO; the Kanchan one failed local certification. Until there are scientific tests, Pahari said, he cannot pass judgment on the best way to contain the arsenic crisis, but those tests have languished, as has the government committee in charge of water quality. The government’s recently reconfigured National Water Quality Steering Committee has only in recent months started “thinking about” permanent solutions to solve arsenic contamination, said Ram Lakhan Mandal, the head of water quality at DWSS. The committee, which includes 19 government and civil society members, has been “passive” and has not met in the past three years, said the government engineer Shakya. But things will change soon pledged Mandal. The government is investing in a pilot project of “deep boring” wells that go at least 100m deep, below the arsenic threshold, estimated to be at most 55m deep in Nepal, according to Smith. An entire deep boring (up to 150m) and water tank (25,000 litres capacity) construction can cost $16,000, of which 20 percent is paid by the community, which is also responsible for building the water tank which funnels the water to village public taps. At one water tank construction site IRIN visited in a section of Nawalparasi known as Kunwar-Ward 13, villagers complained that without cash incentives, volunteers who were supposed to be building the tank were, instead, in their fields harvesting sugar cane. As permanent solutions still prove elusive, families continue to line up for subsidized filters, said Smith. “At the moment we have a waiting list of 700 [requests for] Sono filters,” said Smith. Since 2007, FFF has assembled and delivered up to 1,000 filters to households and schools in villages across the district, replacing Kanchan filters previously installed by FFF and DWSS - an example of how a solution can become part of a greater problem, noted Pahari from UNICEF. Pahari said the number of agencies working to fight arsenic is unclear - as well as the total aid invested in arsenic containment - and the government has little oversight. Mandal told IRIN a law in place for the past 20 years requires that any agency or NGO working in the water sector report its activities to the district office, which then informs DWSS. 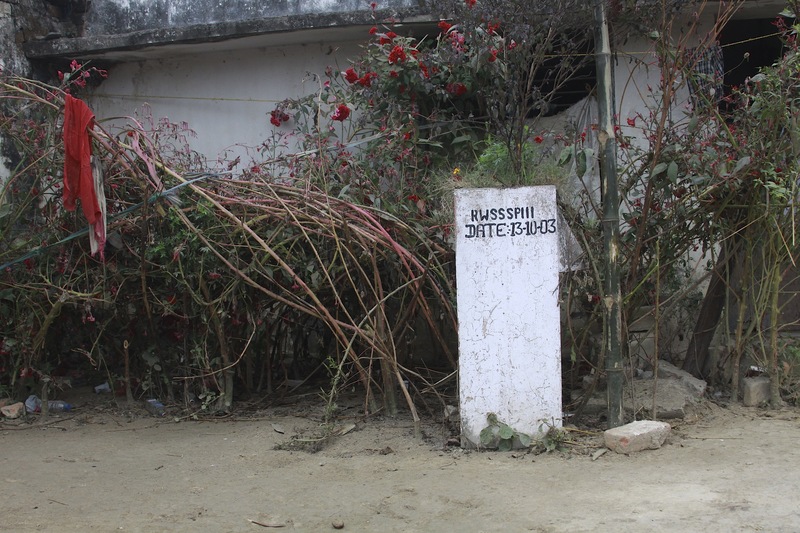 “But this is not happening,” he said, while his colleagues cited stumbling on a Japanese International Cooperation Agency (JICA)-funded project of which they were not aware that is raising awareness about arsenic contamination in Nawalparasi. But a senior programme manager with ENPHO, which is implementing a 28-month $400,000 local capacity building project for arsenic mitigation, said government officials at both the national and local levels had signed off on the project and have been apprised at every step. Meanwhile, in Manari village in Nawalparasi, Smith and her NGO’s technicians visited the family of Ramesh Chaudhary, who died last November from stomach cancer at age 32, six months after his brother Ram Chaudhary, 40, died from similar causes. In 2011, arsenic levels in tube-wells in Manari were 600 ppb, 60 times the limit WHO deems safe to drink. FFF tested the water filter in use in front of surviving family members to quell their doubts as to its efficacy. Ramesh’s mother, widowed wife and son stood by as a technician tested the water. A slip of paper sensitive to arsenic fumes alters in colour to measure the metal in parts per billion. The result was clean, indicating arsenic at less than 10 ppb. 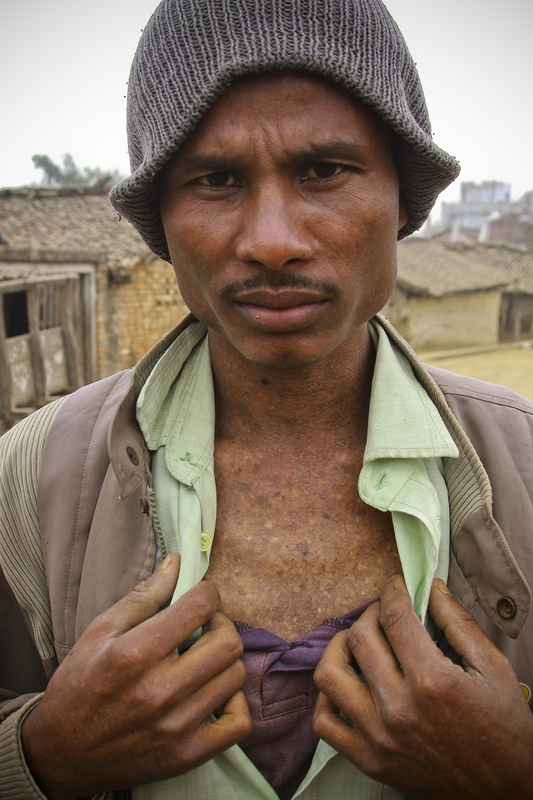 As the group left the village, a 29-year-old man approached Smith and showed her what has become an image far too familiar in the district: dark spots blotting his chest, a visible symptom of arsenicosis. In an August 2011 survey by ENPHO in three sections of Nawalparasi, including Manari, 25 percent of those surveyed had similar symptoms. DWSS estimates solving the arsenic crisis here and elsewhere in the country, including the health fallout, will cost an estimated $18.6 million.